The survey, carried out by UK male cancer charity Orchid spoke to 3000 men aged between 15-45 to ask what they knew about testicular cancer, their attitudes towards it and what they would do if they found a lump. Testicular cancer is the most common form of cancer in men aged between 15-45, and every year almost 2500 men under 45 are diagnosed with the illness. Do you know the symptoms of testicular cancer? We’re hoping that Orchid’s campaign and research will raise awareness of testicular cancer and other male cancers and encourage men of all ages to check themselves regularly and go to their GP with any changes. 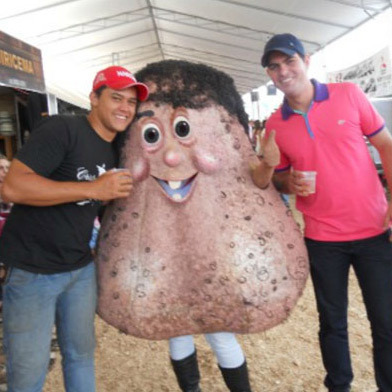 In other parts of the world, however, cancer charities are taking rather a more graphic approach to raising awareness of testicular cancer – Brazil’s Association of Personal Assistance for Cancer has created a spokesperson known as Señor Testiculo (Mr Testicle) – a life size pair of testicles that the association says is “a fun way of broaching a traditionally taboo subject” and gives advice on self-checking for testicular cancer. We’re not saying that pelvic floor exercise will prevent you from getting, or treat you if you are suffering testicular cancer, but at Kegel8 we just want to raise awareness about the illness as it is 98% curable if caught early – so follow Señor Testiculo’s advice and check yourself regularly for any signs of change, and don’t be embarrassed to see your doctor.